WFN Ambassador Gary Love's view of the Junior Forest Wardens. Allweek long at the 2011 National Campout I was impressed with thequality of the people who make up the Junior Forest Wardens. Thisquality is always impressive and when you deal with the generalpublic like Laura and I do at trade shows and so forth. When you getaround a group like the JFW the quality of the people really jumpsout at you and it's a pure quality that comes from solid groundedfamilies spending time with their kids. It is a real pleasure tosee this in action on a big scale at a National Campout. I can saywith confidence that the Junior Forest Wardens attract a real genuinequality of people to their clubs and it's evident as Laura and I seeclubs from all over Canada the same quality in each member. This isno coincidence or accident, this is just the way it is just pureclassy quality people who care about the outdoors passionately. It isfor this reason Laura and I always look forward to sharing with theJFW. 2011 Legacy trail marker for the National Campout.Youhave to go way back to the late 1920's to get back to the real rootsof the Junior forest Wardens. It all started whena group of young boys reported a forest fire to a Forest Ranger inBritish Columbia. The story itself caught fire after it was publishedin Forests and Outdoors magazine, the official publication of theCanadian Forestry Association. There was enough interest from boysall across British Columbia that the Manager of the Canadian ForestryAssociation, at the time, Charles Wilkinson, decided to teach youthabout forest protection. The amazing part is by 1930, 300 boys in theprovince were involved in the warden program. Up until 1932 they wereknown as the Junior Fire Wardens, and did not have the cool reduniforms they have now, however they did have the bronze badge. GirlForest Guards was as an associate group of Junior Forest Wardens in1944 the answer to requests from the sisters of the Junior ForestWardens. In 1974 both groups merged under the Junior Forest Wardenbanner.Lauraand I had the pleasure to see the tradition continue when we watchedas several young people received their first badge the first one youcan get as a JFW, yes still even today the bronze badge. You couldsee how proud the kids were when they received this badge. And it'sat that point it hit me how great this history is, that even todaythe new Wardens are still linked to the very first by this bronzebadge. And now clubs from as far away as Newfoundland & Labrador,Saskatchewan, Alberta, and British Columbia exist. 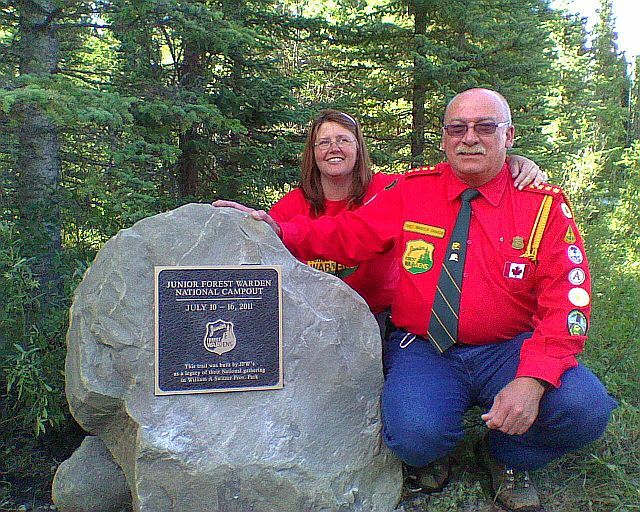 Laura Love & Chief Warden of Canada Dave Cullen with the Trail Marker.Nowyour wondering how I got mixed up in all of this, well we have to goback to before Jackfish Lures was established. My family and I usedto drive from Edmonton to Athabasca to fish at Long Lake. It wasthere that we noticed the Junior Forest Wardens had a camp set up onthe lake. There were times we would see them out in canoes and doingvarious activity around the lake. I met the woman who was the campdirector in 1994 Connie Gottselig, around the camp she was known as"Surf" To make a long story short you only have to meetConnie once. We hit it off and have been friends ever since, and havesome great memories, even one where we kidnapped her from camp andtook her fishing. Tons of fun and many laughs, Connie is still todaya family friend. It was 1996 Connie was looking at some of my firstJackfish Lures creations and of course I had to give some to her andher family to fish with around the lake. 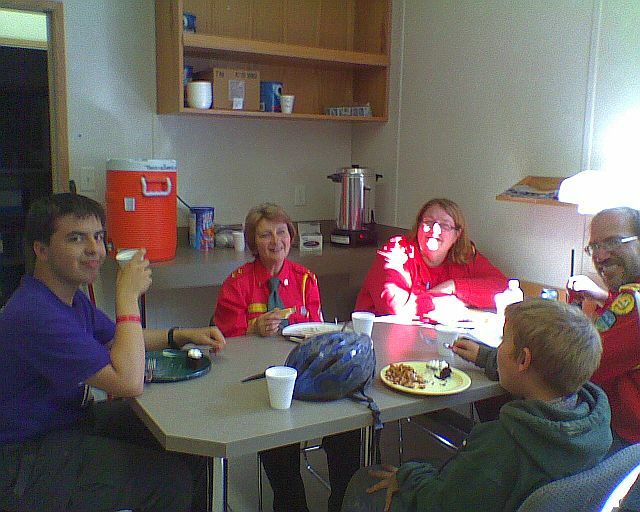 And as Jackfish Lures grew,it did also with the Junior Forest Wardens and in 1998 Conniesuggested I come over and do a program on fishing at the Long LakeCamp. Of course I had wrapped up a major Trade show at the EdmontonBoat & Sportsman's show and was working hard to produce as manylures as I could and then in 1999 Laura and I got Married. Thatsummer in 1999 we did our first program at the Long Lake camp forsome of the kids there for a week of camp. It was the F.I.S.H programI had been working on ever since Connie made her first suggestion tome in 1998. Fun, Interesting, Simple, Honest, These were things Ihad become accustomed to while being around the JFW. I sat for a yearworking on this program at my computer and finally had it down andsimple for kids to understand. 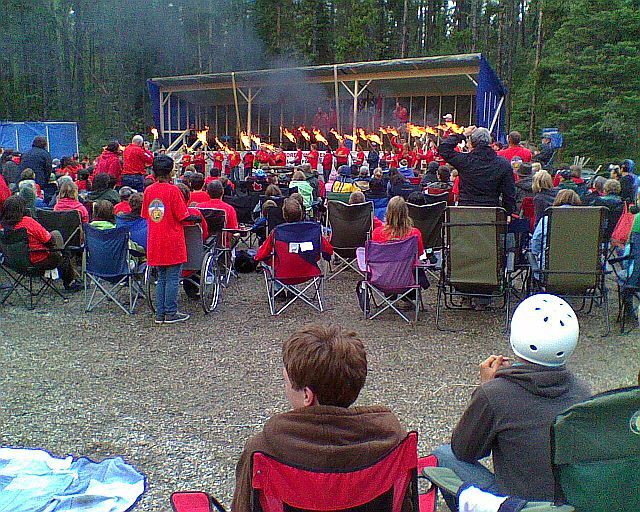 Opening Ceremonies of the 2011 National Campout.Sofor several years we would get invited to Long Lake to do programsfor the kids and it was always fun to go there and visit with Connieand share with the kids our program and they always loved it. It was2005 when we got our first taste of a National Campout Junior ForestWarden style at Narrow Lake. We kept the same approach with theF.I.S.H program and it was a hit. We could only make it out there fora couple of the days for that week but we sure had fun. We would getinvites from different clubs and at least once every year we wouldshow up somewhere for the JFW. In 2008 we were invited back to theNational Campout again and again we could not make it for the wholeweek, we did manage a few days and again with the F.I.S.H program.It's a Campout I will never forget because the Jackfish Lures fieldteam was counting on me to get a ton of photographs of the event toshare with them and I forgot my camera. I know, I know, I still tothis day get a good helping of grief for it, and I deserve it. So Ithought I would redeem myself when we were invited to Big Valley in2010 for a club event and there we brought the F.I.S.H program as itwas from back in 1999 when we first started. Yep I forgot my cameraagain! Willis I am sorry bud and for my Teammates at Jackfish Lures Iam sorry for that, and I deserve all the ribbing I get. Part of the main stage area for the 2011 National Campout.InAlberta we have the first woman Chief Warden Terry Garrett, Now I hadthe pleasure of meeting the Chief Warden, she is amazing a fantasticexample for the kids in Alberta and a great positive influence oneveryone she meets a wonderful lady fun and classy just like all ofthe other JFW families. The Chief Warden of Canada Dave Cullen isagain a fine example to young people and a positive influence on allwho meet him. The whole leadership group every one of them haveclass, honor, and a work ethic that is unmatched. 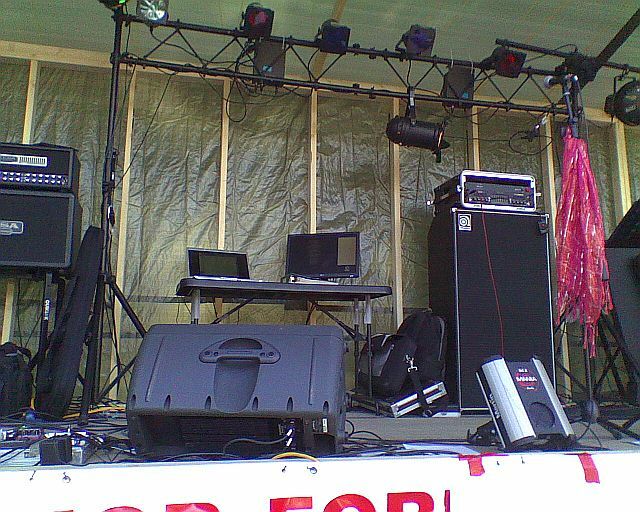 Everything you seein the photos was built on site including the stage a couple of daysbefore the opening ceremonies. After it's all over the same crew stayand clean it all up. They make sure to have local bands show up forentertainment in the evenings and share all sorts of cool differentevents every night all conducted by this amazing group of volunteersand leaders of the JFW. So here is where I am at, now with theNational campout over until next time I have questions for you, andwe were told there is a next time coming. Here are some seriousquestions for you to ponder. Alberta's own Chief Warden Terry Garrett, sharing with friends.Doyou have a JFW club in your area? If not Would you be willing to bethe one to get one started? Do you care about the outdoors enough tomake a difference in the lives of young people? If so Can you start aclub in your area? The JFW have everything you need to start yourclub, and they will help you. Anyone can be part of it go here to getinvolved www.jfwa.ca The Start a Club packages are already set up foryou. The Junior Forest Warden program lets you as a parent be part ofit with your kids, the family is involved, so you get to share andexperience all of it together. Some years from now as your thinkingback on your one life you had to live and your remembering yourexperiences with your family. I guarantee you if your involved withthe Junior Forest Wardens those memories will be happy and rich withquality. 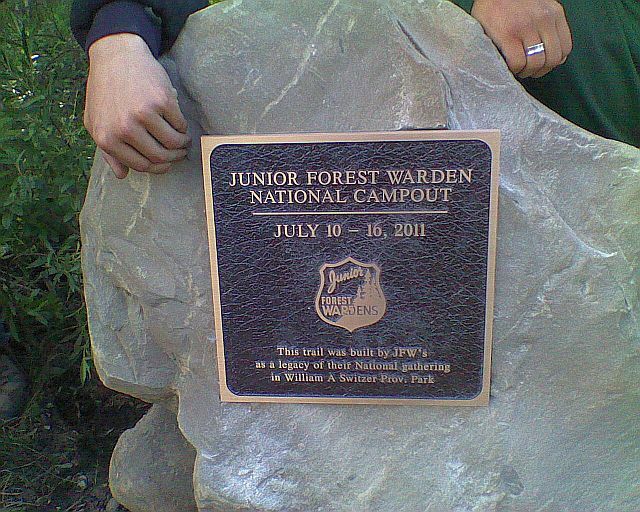 I know I am already loaded with memories and my one timehere on earth has been blessed because of the Junior Forest Wardensand everything they do and stand for. Now it's up to you to getinvolved and join the most classy, honest, helpful organization outthere the Junior Forest Wardens.Gary Love WFN Ambassador, Athabasca, Alberta, Canada.